Tactile Seam Tracking Systems are increasingly used by production facilities and manufacturers who want to become leaner and more efficient, but with a relatively small investment. Like a needle following the groove of a turntable’s record, a tactile seam tracking system tracks maintains the torch’s position over the joint using a sensor to drive a set of motorized slides. The sensor, combined with a variety of standard tips, follows the seam providing constant feedback to the system. Tactile Seam Tracking Systems: Versatile, Yet Precise Automated Weld Joint Tracking. Tactile seam tracking systems from Lincoln Electric are used in many welding processes, including submerged arc (SAW), GMAW, and FCAW. They are ideal for repetitive welding applications especially where precise bead placement is essential. Seam tracking systems are recommended over manual and semi-automatic welding to improve quality and consistency, while reducing operational costs. Simple to program and easy to integrate, Lincoln Electric offers a range of standard systems or customized solutions to meet the requirements of many challenging production environments, such as tank, cylinder and pressure vessel fabrication; beam and structural assemblies; or pipe and tubing fabrication. Motorized Slide Systems: Simple, Flexible and Cost Efficient. These systems equip the operator with motorized joint positioning for a mechanized welding processes. Each system consists of a cross slide, control unit and pendant. The operator utilizes a two-axis joystick to manipulate the torch to its desired location. 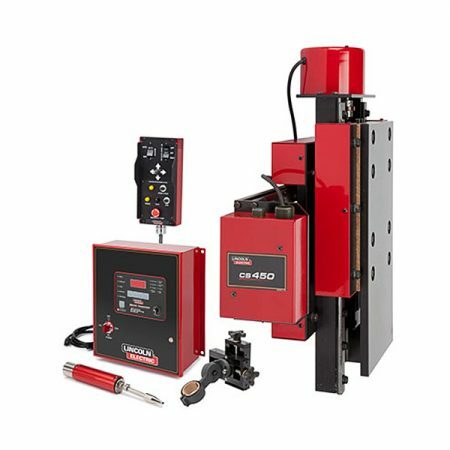 These systems are recommended to improve weld consistency and quality, while reducing operator fatigue and operational costs compared to manual welding operations. Standard or customized solutions are available. Best of all, these system offer low entry cost and modularity for ease of use in many welding configurations. Thousands of companies worldwide trust Lincoln Electric for their Seam Tracking and Motorized Slide systems across a wide variety of industries.